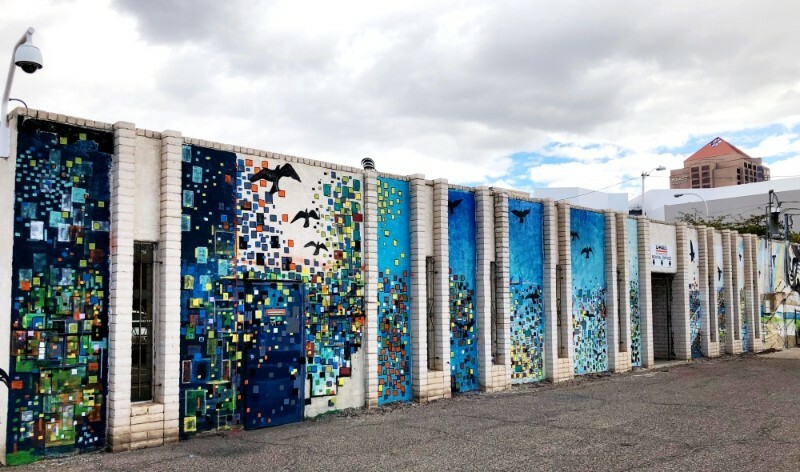 The images above & just below are all found Downtown, in a great walkable 4-block radius. 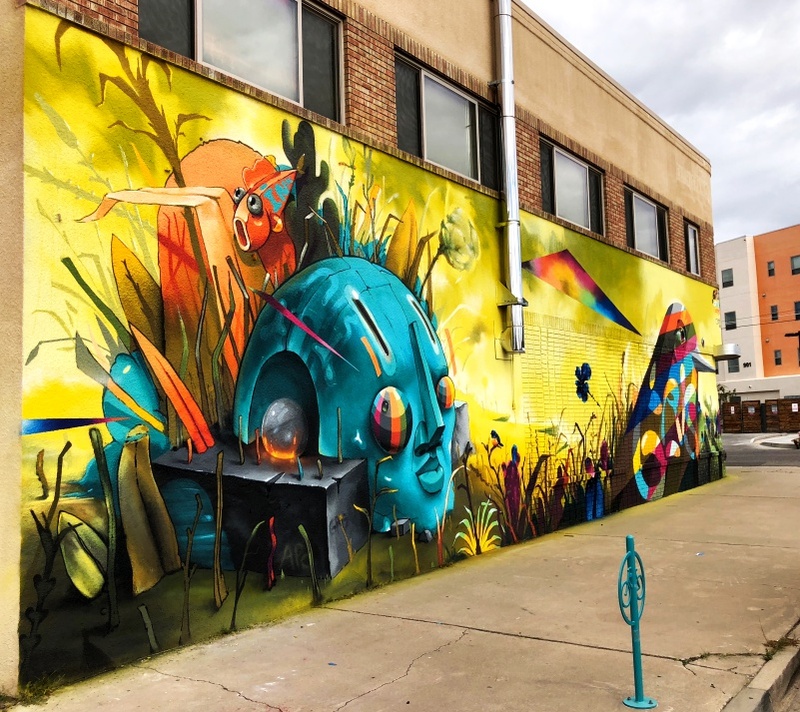 The top mural is a large, futuristic scene south of Robinson Park. It encompasses the wall of 900 Park Ave & can be seen a few blocks away as you approach. Further west are other murals to discover around the Java Joe's building. 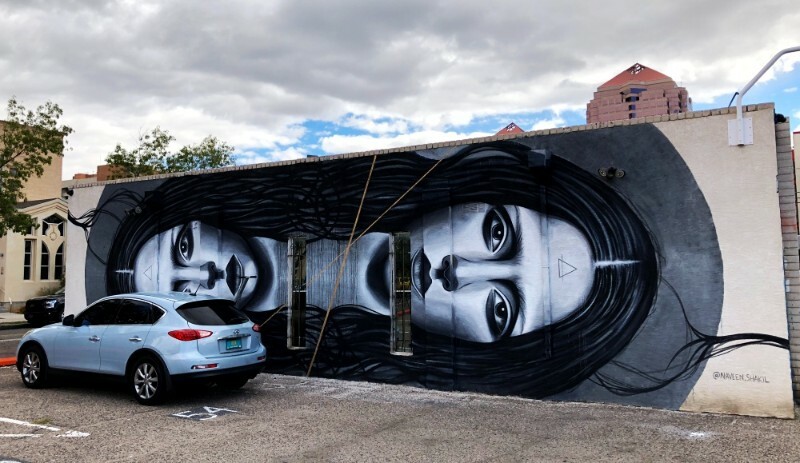 Next are two images on two sides of a building on the edge of a parking lot north of Central Ave & 7th St. The building has murals filling all four sides. 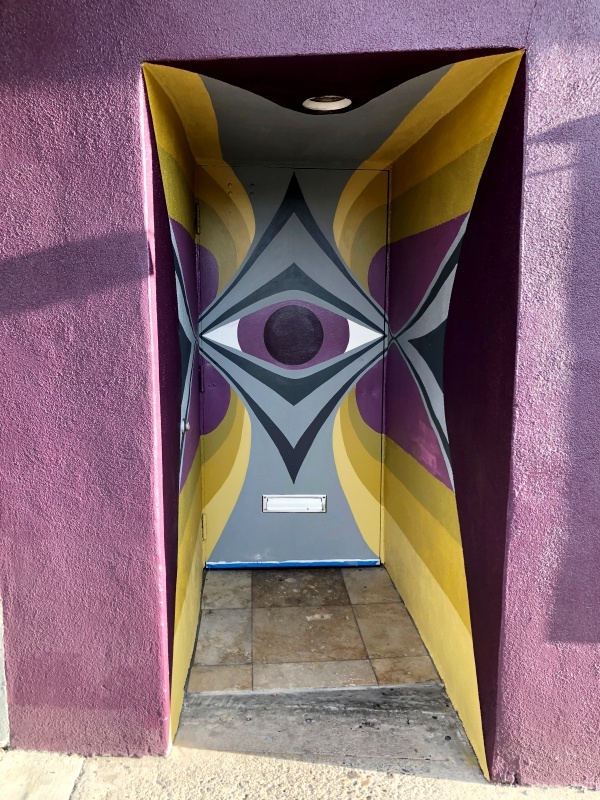 Just above is Collin Salazar's eyes mural, casually & discreetly gazing from a walled-in courtyard easy to miss, east of the Downtown Growers Market. 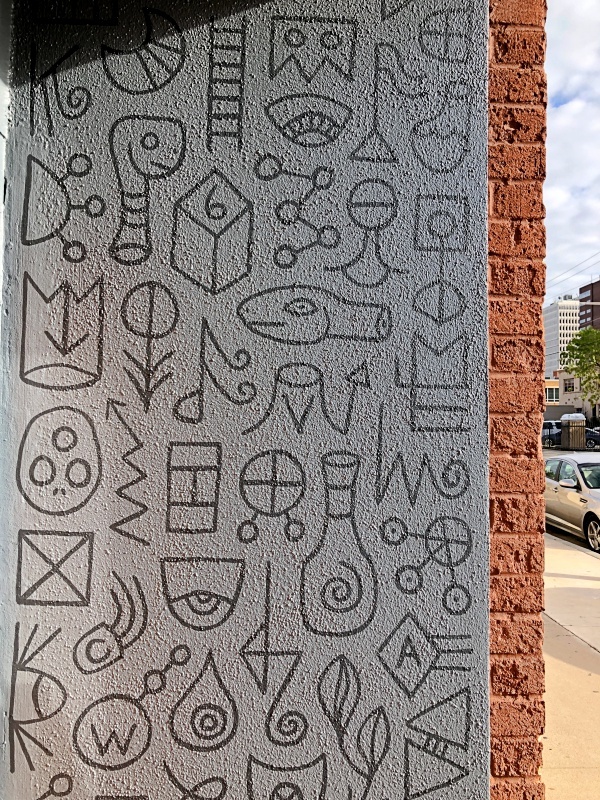 Just below is a discreet piece found inside the doorway to the Relix Gallery & Shop, near 7th & Central Ave., by Thomas Christopher Haag. The Neighborhoods: Downtown has numerous diverse neighborhoods, from historic residential zones including Eighth & Forrester, Old Town & the large 4th Ward. The Historic 4th Ward neighborhood, made up of historic 100+ year old Victorian homes & other styles since, sits adjacent to many of the murals above. 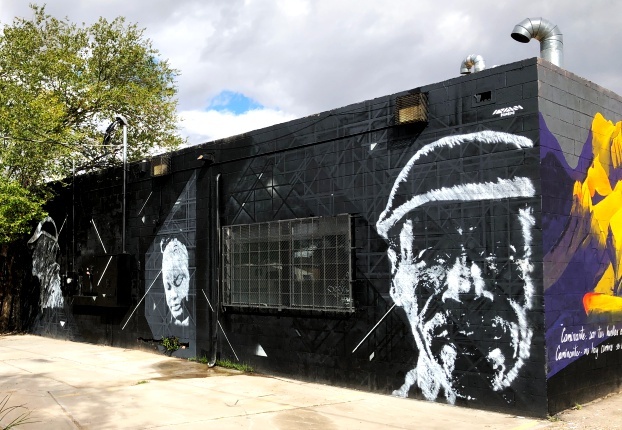 The more dense--& just as old--Raynolds section of Downtown is also adjacent to many of the murals south of the Rt 66/Central Ave corridor. Above are four images adorning West Downtown: a whimsical image found on the side of a thrift store, a canine showpiece by(?) Bik Ismo & two murals on the side & back of the Flamenco Works dancespace--a grande scene featuring a road runner & a full-wall workers tribute. 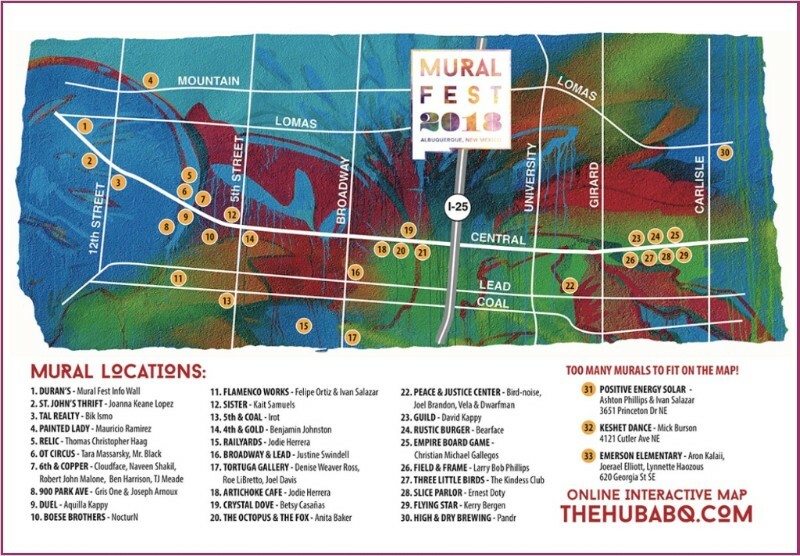 The Mural Fest '18 map below is purposely vague, often encouraging some exploration before you find the artworks--you'll likely pass the already dozens of other public art murals & some private property murals adorning large & small spaces along the way. The two images above are from Huning Highlands/EDo, just East of Downtown along Central Ave. 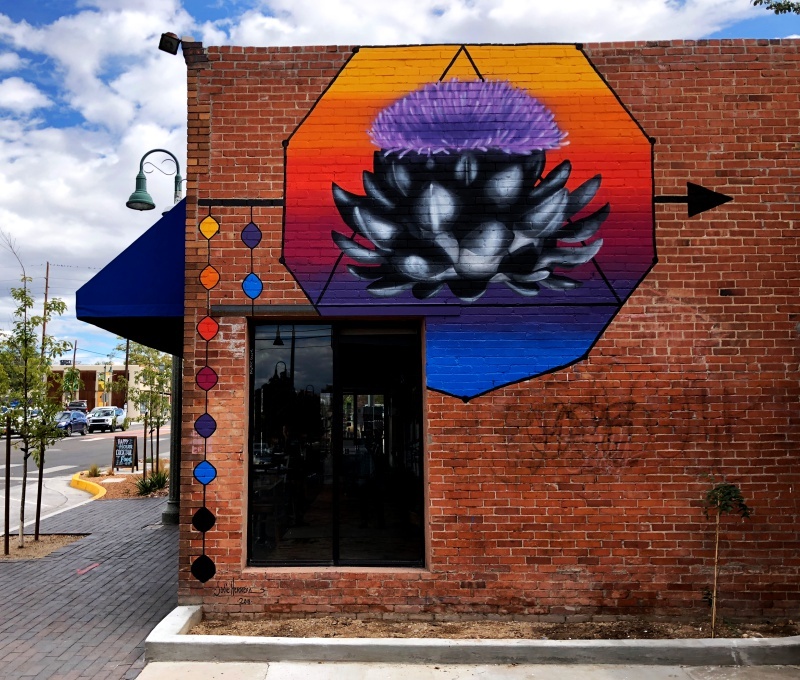 The artichoke mural resides on an outside wall of the iconic Artichoke Cafe & the large wall-length piece--sitting two blocks west of I-25 on Central--was fun to watch the progress as I passed by...using electric scaffolding, it slowly took form over many days & was almost complete the last week of the festival. The Neighborhoods: Huning Highlands sits on both sides of Central Ave. 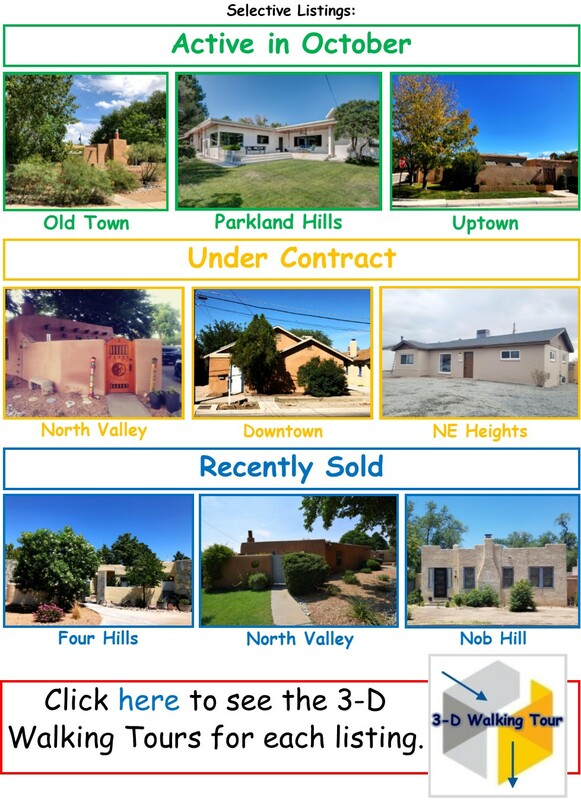 It was the 1st MetroABQ 'suburb,' 120+ years ago, & today is known for it's often pristine turn-of-the-century Victorian residences. "This year's theme When Nature Calls brings focus to Planet Earth’s climate crisis and how it is affecting all life on this floating rock we call home. 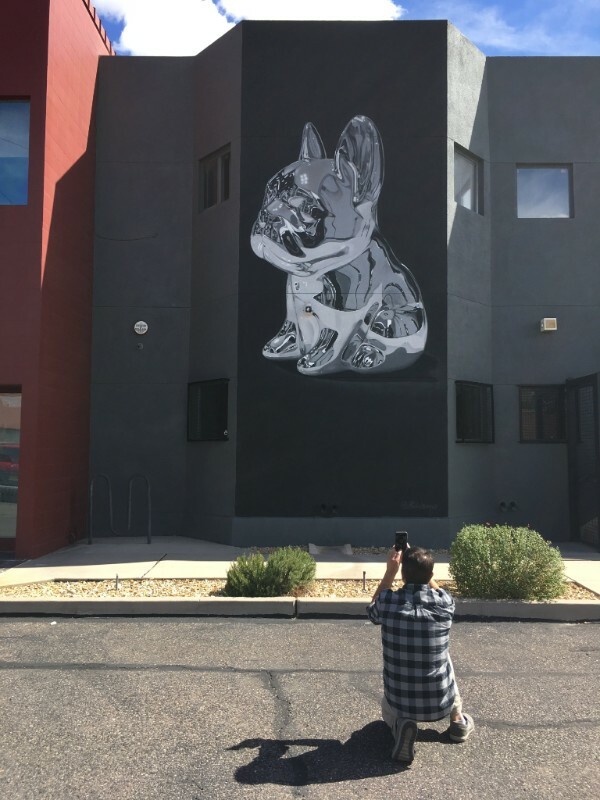 From California being on fire to Houston, Puerto Rico & Hawaii drowning in water and lava to New Mexico facing one of the worst droughts in history - we felt a need to bring our world community together through murals, music and culinary arts to highlight solutions we can all play a part in moving forward. 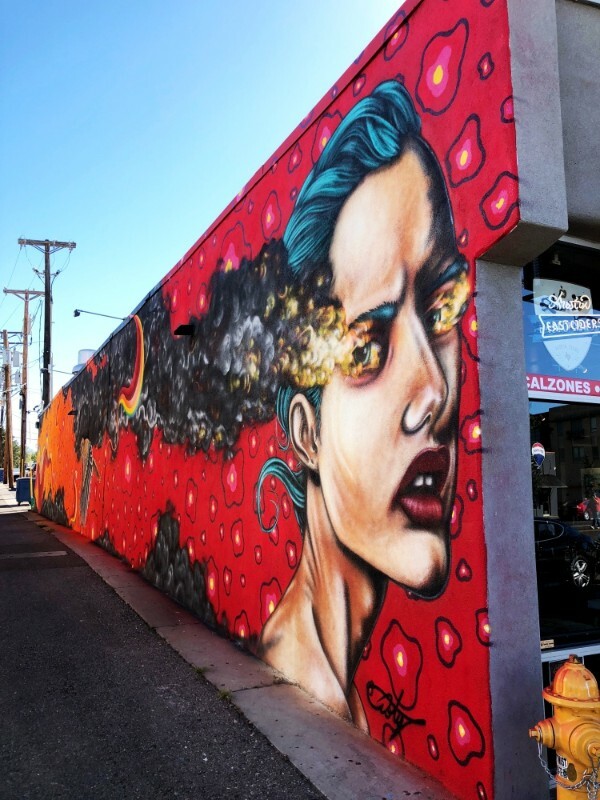 Mural Fest is a catalyst in the development of a more unified, safer, beautiful city." 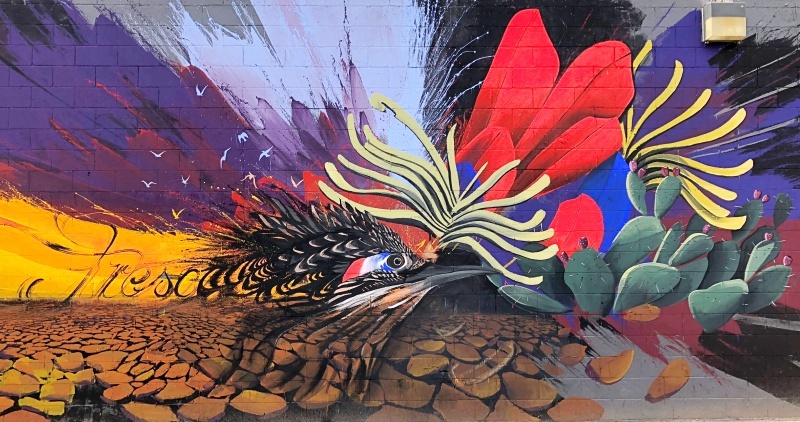 I noticed a few similarities of element in some of the pieces, which seems to correspond well with this years theme: nature is present in most of the murals, especially cholla & prickly pear cactus, found on several pieces; also, hummingbirds & roadrunners can be found regularly, too. 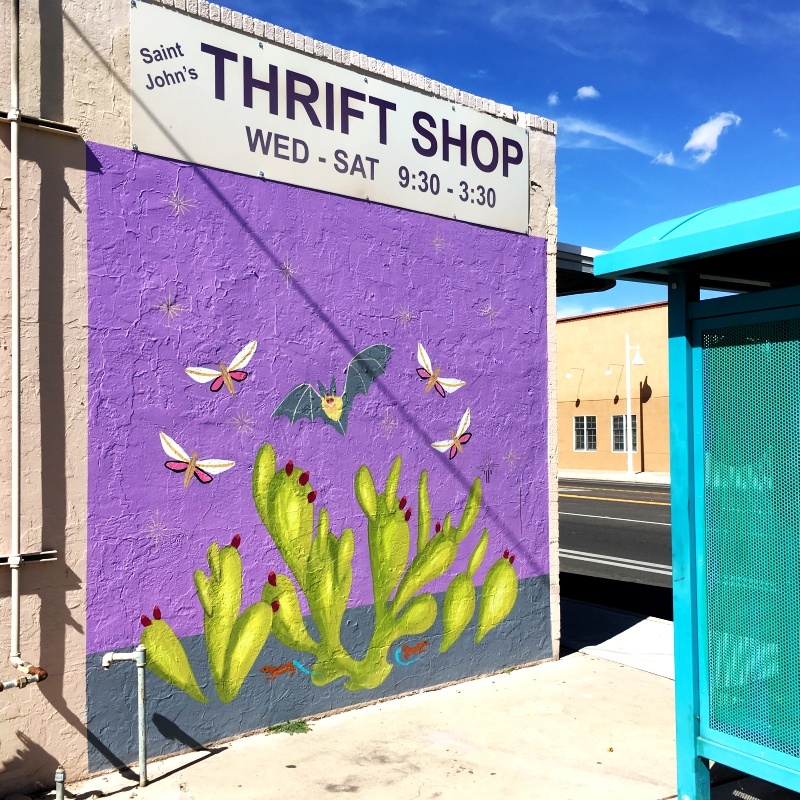 Along with the murals, throughout the three weeks, the festival also featured block parties, art exhibits, music & culinary events. Over 100 sponsors contributed toward the success of the annual event. The busy I-25 commercial corridor north of Candelaria Rd along the frontage road is a busy thoroughfare. 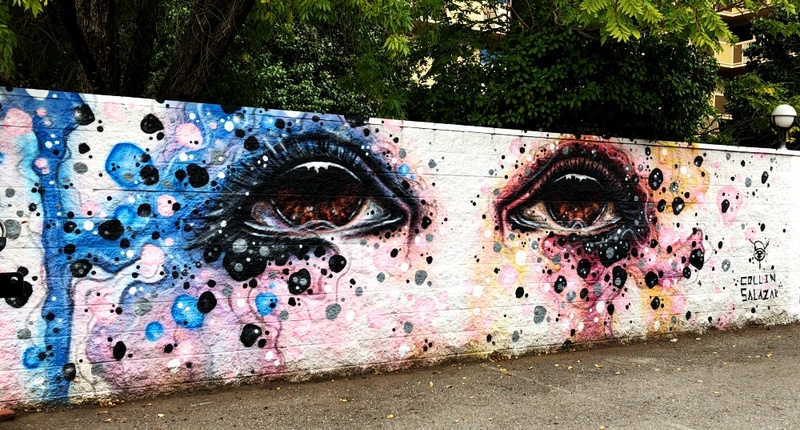 where you will find the mural below. 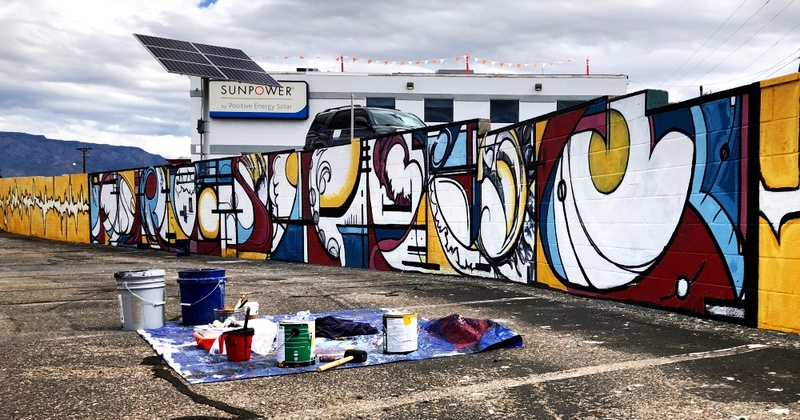 It covers the length of a formerly blank concrete block wall outside the Positive Energy Solar headquarters. It was still being completed when I stopped by, apparently they were away having lunch. It's a pretty cacophonous piece, flanked on each side by what looks like a heartbeat. 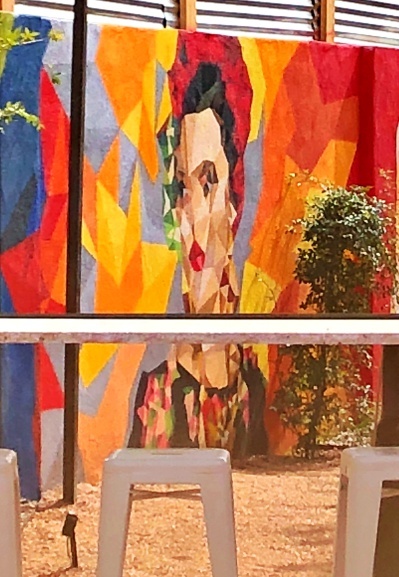 Above are three of more than half a dozen Nob Hill murals featured in the festival. 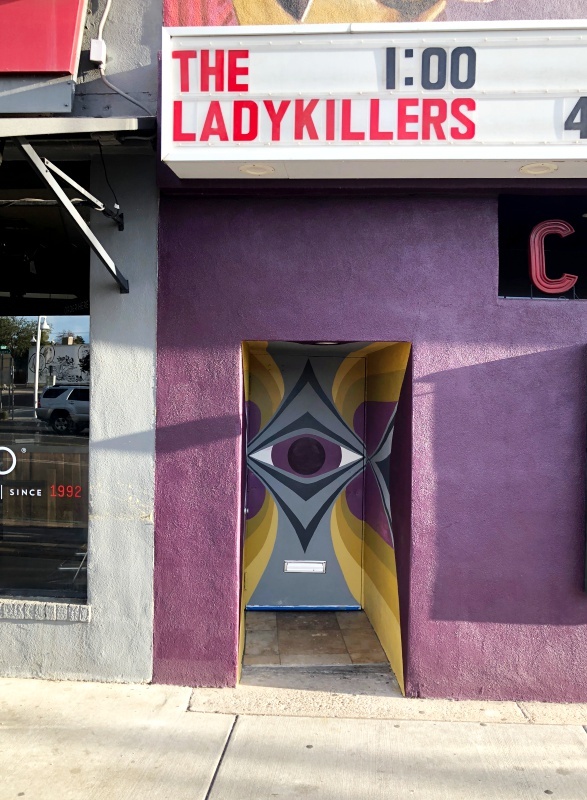 For the woman surrounded by red: Ernest Doty updated his wall outside the Slice Parlour--it's my favorite mural this year & is stunning up close...Also, The Guild Cinema exit doorway now sports a geometric eye design that is easy to miss. 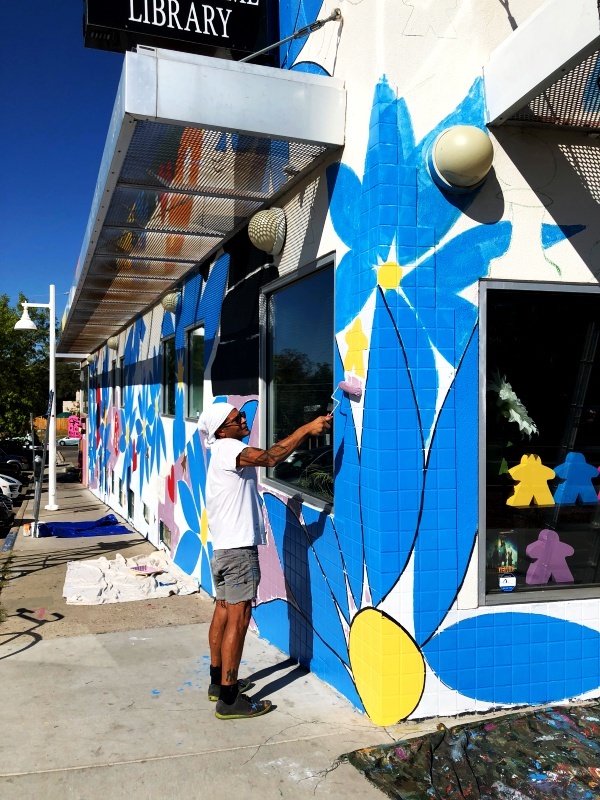 A muralist outside Empire Board Game Library works on his wall during the festival. Mural images from last year's Mural Fest 2017 can be found here, here, here & here.